Be still, my soul, and steadfast. the heart still play its true part. That the gift has been given. The poet and the psalmist have the true message. We have to slow down to truly feel the loving touch of God’s hand. We are in the midst of this Advent season and are waiting for the coming. At first thought, the waiting should be in stillness and calm but that not the way it is at all. We are so rushed and busy with the many responsibilities and obligations of the season. There are gifts to buy, parties to go to, special church services to attend, and for most of us, Christmas will be a relief. It is a relief, because we can slow down and rest from the “holidays” that our world has created. Let me urge you to think in a counter-cultural way. Try to see these coming days between now and Christmas day as a time to reflect on the true meaning of Christmas. The true meaning of Christmas is love. “For God so loved the world that he gave his one and only Son, that whoever believes in him shall not perish but have eternal life. For God did not send his Son into the world to condemn the world, but to save the world through him.” (John 3:16) The true joy of Christmas is the celebration of this incredible act of love. That is so easy to forget in the social cacophony of competing ideas that surround us. Let us resolve not to be carried away by popular culture or religious extremism. Take the time to make eye contact and speak to store clerks who serve you. Reaffirm your love(with words) to your family and friends. Share your belief in the love of the God of Christmas with someone. Attend worship on Christmas Eve. Don’t argue about Merry Christmas or Happy Holidays. Spend a little time in silence every day. Those are just a few of the many things that we can do in this season if we just slow down and look outside of ourselves. I am sure that you can think of some on your own, but you have to be still long enough to do so. I hope that you can find a way to grab the opportunities that come with the Christmas season. Lord, there are times when I just want to ask your help so that I may just spend some time living like you. May I follow the example of Jesus as I share the love that was modeled by Him. Such a love is without strings or stipulation but merely a love that is waiting to be accepted. Let me reach out with open arms to all. May you guide in my decisions this season and allow me to be a source of blessing to those I touch. The silence that is experienced in being quiet and alone is not the deepest and most satisfying silence to be had. The heart’s desire is for the Eternal, a level of silence that is penetrating in its power to draw forth the secret communication of the soul. Here, we discover that silence speaks and we learn how poor we are when we do not abide in this dimension. In this great silence, our being finds its roots in God, is nurtured inwardly, and gradually expands into a form of life that is itself eternal. Lord, have I been silent enough today? It is sometimes difficult to be silent and still enough to hear you. The world teaches me that everything is achieved by noise, but God longs to speak with no words. I am still God, speak to me. Have you not known? Have you not heard? God seems to bless those who wait. Waiting is a timeless discipline with eternal rewards. The scripture has many stories of those who waited and learned. Noah waited for years as he built a boat on dry land and learned the lesson of deliverance. Jonah waited three days in the belly of the fish and learned the lesson of obedience. The prophets waited for centuries to see the Messiah and learned the lesson of faith. 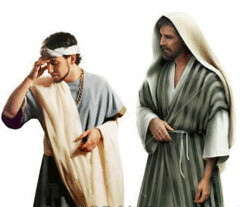 Joseph waited in prison and learned the lesson of forgiveness. Zacharias waited to speak and learned the lesson of humility. Anna and Simeon waited a lifetime to see the Savior and learned the lesson of perseverance. Waiting during the season of Advent can serve as a discipline to teach us many spiritual truths. While waiting we can develop patience and true obedience. We can glimpse the hugeness of God’s love and grace and learn to recognize holiness when we encounter it. Waiting nurtures our compassion and opens our eyes to see others in need. It opens our hearts to service and fosters a freedom to give and encourage others. As we pause and wait for God, we have time to assess our priorities, discover happiness where we are and develop an appreciation for what we have. Advent is a time to deal with our fears, our anger, our disappointments, and learn to both give and receive forgiveness. It is a time to internalize the cleansing joy of repentance and to know the peace of taking last place. While we wait, we can use the unknown time to realize that living with mystery builds faith, and suffering and sacrifice reveal God to us. While waiting we acquire a dependence on God, we gain hope, and we become sure that while we wait we are never alone. During Advent, the Church waits to celebrate the first Advent of God into the world and waits for completeness and perfection at the Second Advent. In the waiting, we find our peace. Reflection – What have you learned from God during those waiting times of your life? Lord, teach me the value and virtue of waiting in this impatient world. The prophets of old knew that the things that they proclaimed were not yet evident. As we proclaim your coming may with do it with confidence and determination. Lord Jesus, you show us the loving face. Help us to love you in return. At that same hour Jesus rejoiced in the Holy Spirit and said, ‘I thank you, Father, Lord of heaven and earth, because you have hidden these things from the wise and the intelligent and have revealed them to infants; yes, Father, for such was your gracious will. How wonderful it must have been to hear Jesus speak those words! God has revealed something special to them, not because they were great students are especially smart, but because God wanted them to know who Jesus was. God still wants us to know who Jesus is. That’s why we have the Bible. That’s why we have the church. Through the power of the Holy Spirit, we know that Jesus is Lord of Heaven and Earth and it’s not because we figured out something or because we have use our brain power instead, it’s because the father wants us to know who Jesus is so that we can be saved from sin and death. Father, we thank you for showing us your son. May we come to see him in his kingdom. This Sunday is the first Sunday of the Advent season of the church. Advent is a special time for the church. The time is a mixture of anticipation and spiritual preparation for the coming of the Christ child. Such preparation involves repentance and joy.Those two are a rare combination. I share with you some words that my wife wrote a few year ago about Advent that emphasize the joy of the season. Advent comes from the Latin meaning “a coming” or “arrival”. The season begins on the Sunday nearest to November 30 and ends on Christmas Eve. Advent begins our new church year as Christ comes to us again with the peace and joy needed to take us through another year. During the season of Advent, the church celebrates two comings of Christ. First, we remember his incarnation, the coming of the Messiah, the world’s Savior. Second, we look forward to the second and final coming as reigning Lord and Judge. We thank him for His first Advent, prepare for his Second Advent, and celebrate His Presence through the Holy Spirit. It is a unique time when the past, the present, and the future realities of God are combined. Advent gives voice to the joy and hope that the Christ Child brought to the earth and the expectation of the total restoration of God’s Kingdom when He comes again. The church looks forward to the completion of our salvation and the end of the world’s suffering when Christ comes again. The season forces spirituality into an increasingly secular Christmas and enriches our relationship to God, to each other, and those who have come before us. The earliest recorded observances of Advent are from the fourth century. Monks set aside approximately six weeks before Christ’s Mass as a time of penitence and devotion and fasting. Advent became a time when new Christians prepared for baptism. For more than a thousand years, the church has set aside a four week period to recover Christmas as a holy time of expectation and preparation. 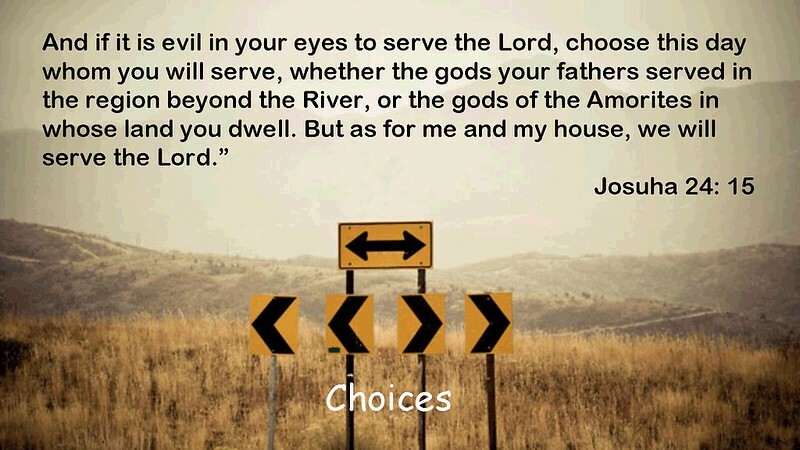 Choices – they seem unending, especially at Christmas. The Scriptures can be our guide as we observe the way God chooses and the way he challenged others to choose. From the very beginning when Adam and Eve chose their own way over God’s provision, each person who has ever lived has faced that decision. Martha, out of self-righteous frustration, reprimanded Jesus because he would not condemn her sister, Mary, for not helping her with chores. Jesus simply tried to help her understand that Mary, in choosing to simply sit in His Presence and internalize his every word ,had indeed chosen “the good part.” Mary chose the part that never goes away, never gets old – the part that is eternal. The rich young man expected a quick, easy answer from Jesus. He needed to know how to inherit eternal life. He could not imagine that inheriting eternal life could be any more challenging than inheriting his father’s wealth. But Jesus told him he would have to make a choice between what the world could give and what God could give. The rich young man chose the part that goes away – the part that is temporary. The Christmas narratives portray God’s nature by the choices He made. God chose a teenage peasant girl, not a daughter of a ruling Pharisee. God chose a carpenter, not a king. God chose Nazareth, not Jerusalem. God chose a stable, not a palace. God chose a feeding trough, not an ornate cradle. God chose shepherds, not rabbis. God chose to show his star to Gentiles, not Jewish royalty. God chose poverty, not wealth. God chose humility, not position. God chose earth, not heaven. This Advent, this season of endless options, is a perfect time to evaluate our decisions, to align our choices with the eternal and holy and divine. Jesus told us that a good person with a heart full of good treasure makes good choices, lives a good life, recognizes holiness, and lives in the Kingdom of God. He told us that choices reveal our souls, our decisions come from what dominates our hearts, and our lives mirror the Master that controls them. O God, you know that today-or very soon-I must make a decision which is going to affect my whole life. Help me to choose rightly-and to choose the right way. Grant me your guidance, and with it grant me the humble obedience to accept it. Help me not necessarily to choose what I want to do, but what you want me to do. Grant that I may not be swayed solely by fear or by hope of gain, by selfish love of ease or comfort or by personal ambition, by the desire to escape or by longing for prestige. Help me today in humble obedience to say to you, “Lord, what will you have me to do?” and then await your guidance, and accept your leading. Hear this prayer of mine and send an answer so clear that I cannot mistake it. This I ask for your love’s sake! Today is the First Sunday of Advent. The Christian lives in the Hope. We look to tomorrow with confidence, even absurd confidence. As the White Queen told Alice, “Why, sometimes I’ve believed as many as six impossible things before breakfast.” There is an exuberance in the Christian Life, an exaltation which passes logic. Why? Because we belong to Christ. · I believe in God, who is for me spirit, love, the principle of all things. · I believe that God is in me, as I am in Him. · I believe that the true welfare of man consists in fulfilling the will of God. · I believe that from the fulfillment of the will of God there can follow nothing but that which is good for me and for all men. · I believe that the will of God is that every man should love his fellow men, and should act toward others as he desires that they should act toward him. · I believe that the reason of life is for each of us simply to grow in love. The lighting of the four candles during winter may well go back to the ancient fire wheel, lighted in the darkest time of year to lure the sun back and ensure another spring. 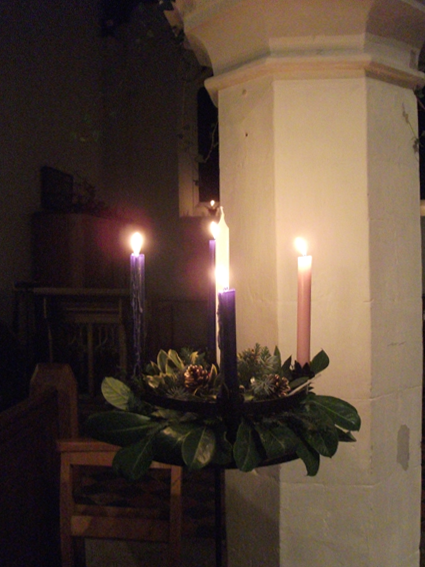 Each candle has a specific meaning associated with different aspects of the Advent story. The first one almost always symbolizes expectant hope and is sometimes associated with prophecy. The others are organized around characters or themes as a way to unfold the story and direct attention to the celebrations and worship in the season, such as Peace, Love, Joy. The third is generally symbolic of Joy at the imminence of the coming of Christ. A fifth, white or gold, candle — called a “Christ Candle” — is often lit in the center on Christmas Eve and/or Christmas Day to signify Christ’s birth. The color scheme and order of symbolic associations for the candles is largely arbitrary but several traditions have adopted them for the meaning they carry. For Catholics and Protestants alike, the color of the first, second and fourth candles are purple .but the third is rose-colored, to joyfully represent a Sunday with a less somber liturgy. A common way of marking the days of Advent, particularly among children, is an Advent Calendar, traditionally made of wood but today usually made of cardboard. Typically, there is a tab that can be unsealed and raised for each day of Advent. Something is hidden behind each tab, such as a devotional reading, a religious messages, a seasonal picture, a piece of candy, or a small item such as a toy or charm.